Casting Call: Planning to own a tiny home? We Want You! Are you planning to buy a Tiny House? Have you always dreamed of living in a luxury home? Now you can have both! Don’t downgrade when you downsize! HGTV in association with Bodega Pictures are now seeking families, couples and individuals who are looking to build or own a tiny home. Candidates will be introduced to a highly skilled, top-of-the-line tiny home manufacturing team to design and build a 100% customized house that boasts high-end amenities creature comforts and above average design and detail. This is your chance to live in a premium quality home tailored to your desires and your unique personality! Having the home of your dreams doesn’t have to break the bank! Important: To submit please email your name, location, your budget range, FULL contact information (phone and email) recent photos of yourselves and a brief bio describing why you are interested in owning a tiny home. * Interested candidates must be located in the U.S. and plan to either build or buy a tiny house within the Fall of 2015 or by Early 2016. 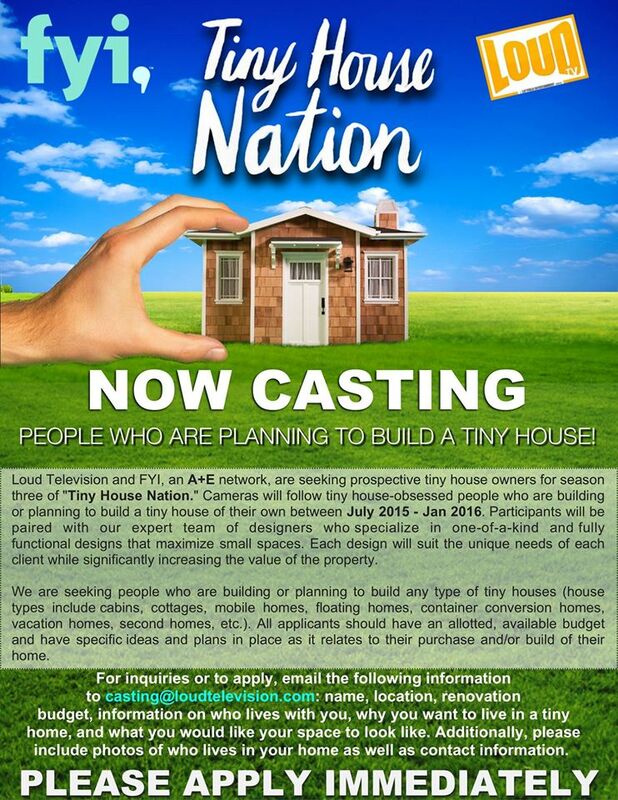 Loud Television and FYI, an A+E network, are seeking prospective tiny house owners for season three of “Tiny House Nation.” Cameras will follow tiny house-obsessed people who are building or planning to build with our expert team of designers who specialize in one-of-a-kind and fully functional designs that maximize small spaces. Each design will suit the unique needs of each client while significantly increasing the value of the property. We are seeking people who are building or planning to build any type of tiny houses (house types include cabins, cottages, mobile homes, floating homes, container conversion homes, vacation homes, second homes, etc.). All applicants should have an allotted, available budget and have specific ideas and plans in place as it relates to their purchase and/or build of their home. 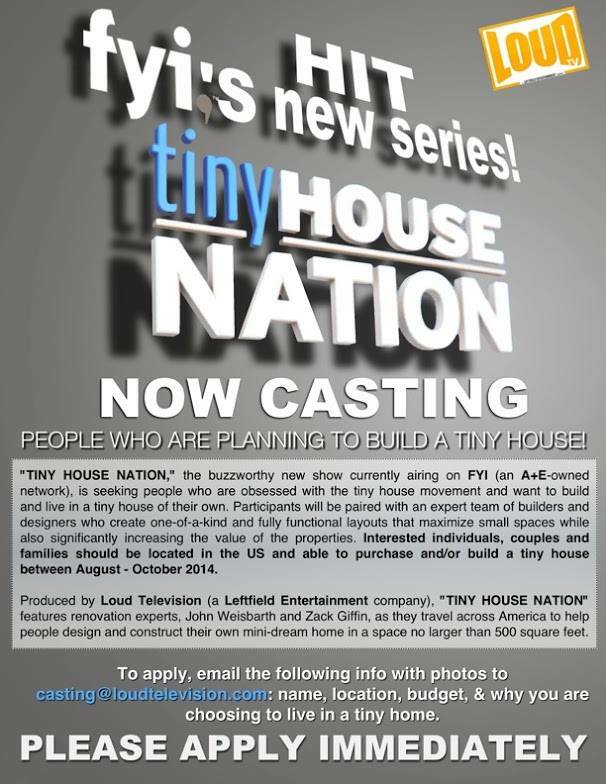 For inquiries or to apply, email the following information to casting@loudtelevision.com: name, location, renovation budget, information on who lives with you, why you want to live in a tiny home, and what you would like your space to look like. Additionally, please include photos of who lives in your home as well as contact information. 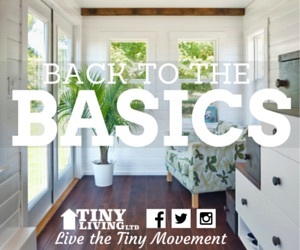 On 9 July 2014, the premiere of the Tiny House Nation television show was broadcast and promoted through the new A&E lifestyle network FYI. The show hosts are John Weisbarth and Zack Giffin. Here are links to the episodes from the Tiny House Nation videos page. Global Availability. Please note that viewing is not available in all countries such as Canada, Denmark, Netherlands, Sweden and maybe others (we’re receiving reports from members). 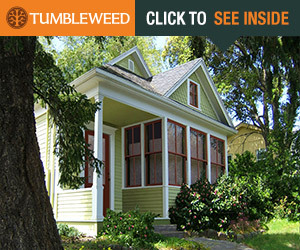 In “Tiny House Nation,” renovation experts and hosts, John Weisbarth and Zack Giffin, travel across America to show off ingenious small spaces and the inventive people who live in them, as well as help new families design and construct their own mini-dream home in a space no larger than 500 square feet. From a micro-apartment in New York City to a caboose car turned home in Montana to a micro-sized mobile home for road tripping – this is a series that celebrates the exploding movement of tiny homes. From pricey to budget friendly, “Tiny House Nation” is not a typical design show, but one that proves size doesn’t always matter – it’s creativity that counts. Here are some graphics obtained from the web that you can use to promote the show through your blogs, websites, emails, and social networks. When possible, link to the official show URL at this address http://www.fyi.tv/shows/tiny-house-nation. Square images work well with Twitter. 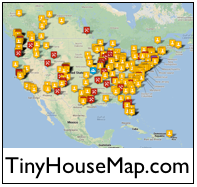 Remember to use the hashtag #TinyHouseNation. The maps below show recent visitors to this page. Click a map for a larger gallery view.